Gradua 3.5hp water-cooled. Reg No: LH 815. Exhibit at the National Motor Museum. 1913. Zenith Type C. Reg No: AE 8467. Exhibit at the Glasgow Museum of Transport. 1921. Type C 677cc. Exhibit at Glasgow Museum of Transport. 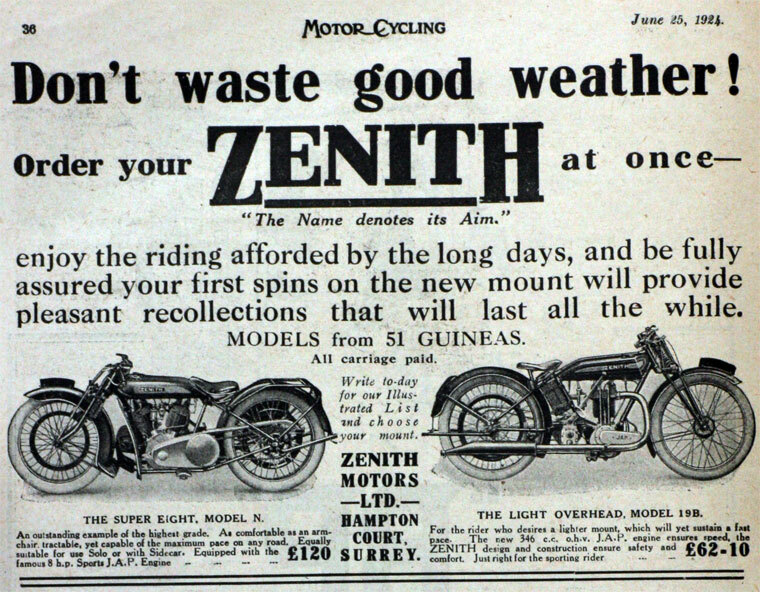 Zenith motorcycles were produced from 1905 to 1950. 1904 The firm began in Stroud Green, Finsbury Park, North London, before moving to various locations in and around the London area. 1905 A strange machine appeared, called the Bicar, that was said to be 'a revolution in motorcycles'. It was first seen early in the year, at the Crystal Palace show, named the Tooley Bi-Car after its inventor and exhibited by Bitton and Harley of Great Yarmouth. By July, it had been improved and renamed the Zenith. It had a novel frame, with the main tube running from the rear wheel spindle along the machine, round the front wheel and back again. Under this, on each side, ran a second tube to carry the weight of the rider and the engine, which was hung from joints to eliminate vibration. It had hub centre steering, so there were no front forks as such - the handlebars were connected to the wheel axle by stays. The engine was a 3hp Fafnir with a free-engine clutch and belt drive to the rear wheel, which had a drum brake. They also offered the Tricar with a 5hp engine and two speeds, both of which were soon options for the Bicar. 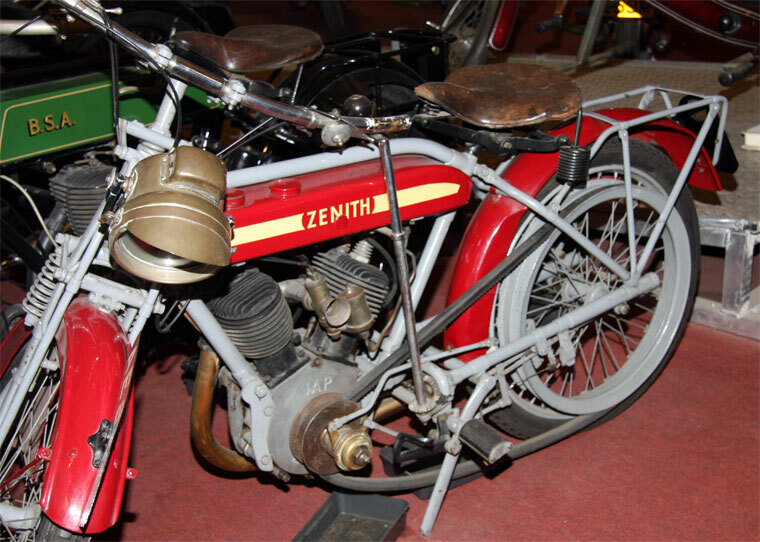 1907 Motorcycle production began with the sprung-frame Zenette and its 3.5hp Fafnir engine. The firm was run by Freddie W. Barnes who patented his own Gradua Gear system, which combined a variable engine pulley with movement of the rear wheel to maintain the correct belt tension. It used a system of rods connected to a single handle, so the gear could be altered while on the move. This was very useful in hill climbs as the Zenith rider could change gear on the upward journey, while the other competitors had to make do with a single choice of gear ratio. 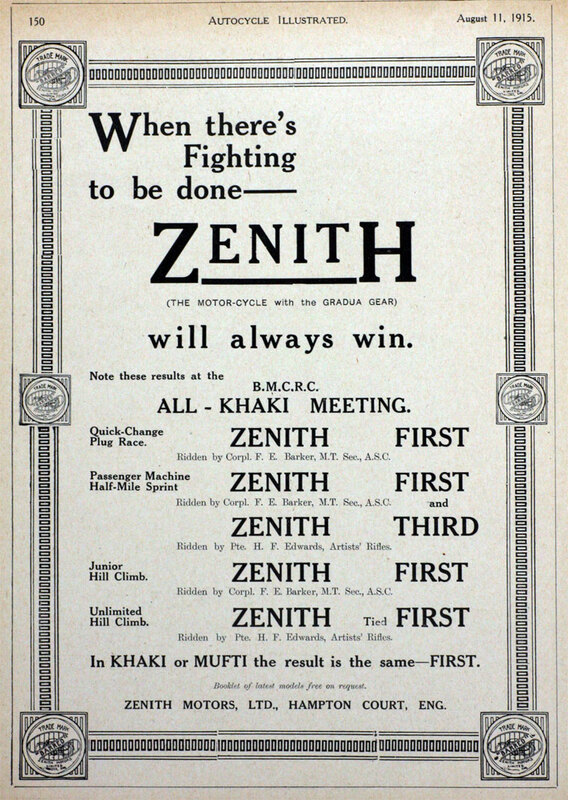 Because of this, some clubs banned the Zenith from their events, but Zenith was quick to recognize the publicity value and took the word 'barred' as their trademark. 1909 At Brooklands, Barnes set the first record Test Hill early in the year. 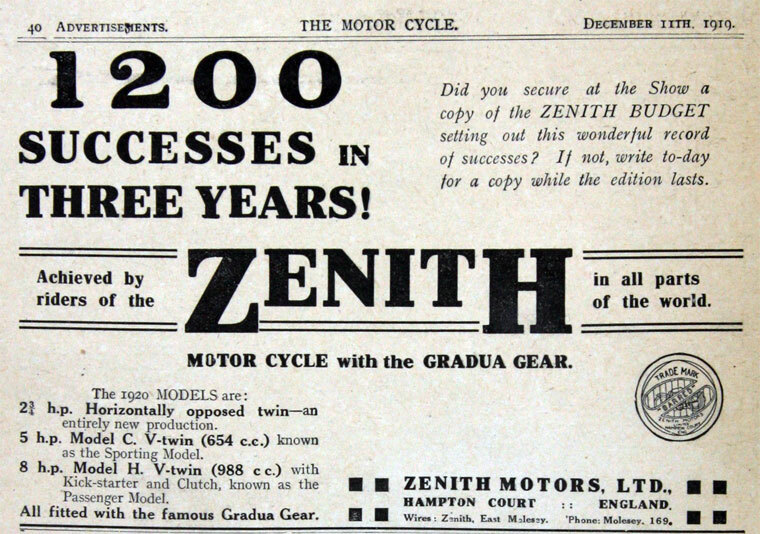 All machines were now sold as Zeniths and the firm became much more successful. 1910 The Gradua Gear mechanism was improved and tidied up, as was the whole machine, which looked typical of the era and had Druid forks. 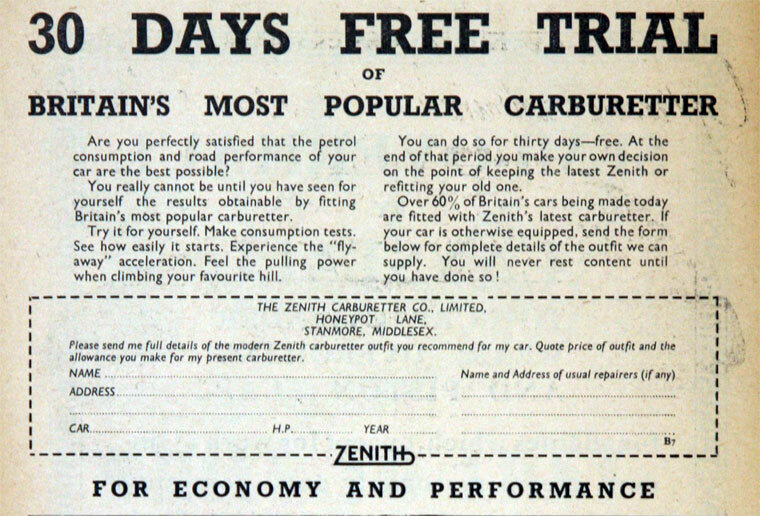 The Zenette continued to be offered for that year. 1911 The range was the Zeneth Gradua, with 3.5hp single or 6hp V-twin JAP engines. The 'barred' advertisement was used as a promotion for the ease with which the Gradua Gear coped with hills. 1912 During the year there were many detail improvements. 1913 The range added three racing models with JAP ohv engines, 2.75hp and 3.5hp singles and an 8hp V-twin, plus a road model with a 4hp water-cooled Green engine. 1914 The models were much revised, with a chain-driven countershaft, complete with clutch and kick-starter, mounted in front of the crankcase. The countershaft carried a large pulley to drive the rear wheel by a long belt, while retaining the Gradua Gear and rear wheel movement. The engines still came from JAP, but all were twins of 3.5hp, 6hp or 8hp. During the year, the firm moved to Hampton Court, Middlesex and continued with their twins until world War I stopped production. 1919 Production started again with the 6hp and 8hp models, still with the counter-shaft and Gradua Gear, but, by November, these were joined by a 346cc flat-twin, still with the same transmission. 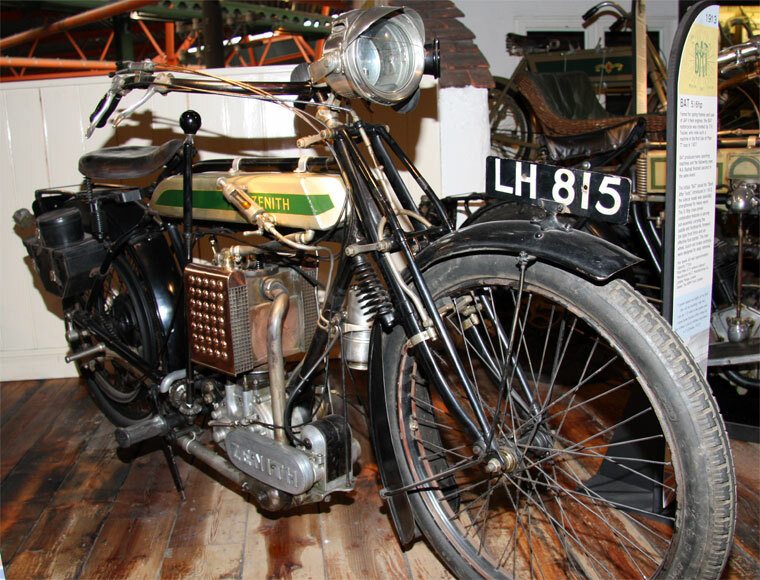 1921 A model fitted with a 494cc oil-cooled Bradshaw flat-twin engine was introduced and was soon listed with the choice of the Gradua gear or a three-speed Sturmey-Archer gearbox and all-chain drive. 1922 Most models had the above option. 1923 Several singles were introduced, all of conventional form. There was also a special built for an enthusiast, fitted with a Barr and Stroud V-twin sleeve-valve engine. 1924 The Gradua Gear had run its course, so the company offered all chain drive on a range of singles and V-twins that increased annually. All were typical of the decade. One used an ohv single-cylinder Bradshaw engine. 1926 By now there were machines with 348cc Blackburne, 490cc JAP singles and 680cc and 980cc V-twin JAP engines. 1927 A 175cc sv lightweight was added for that year only. 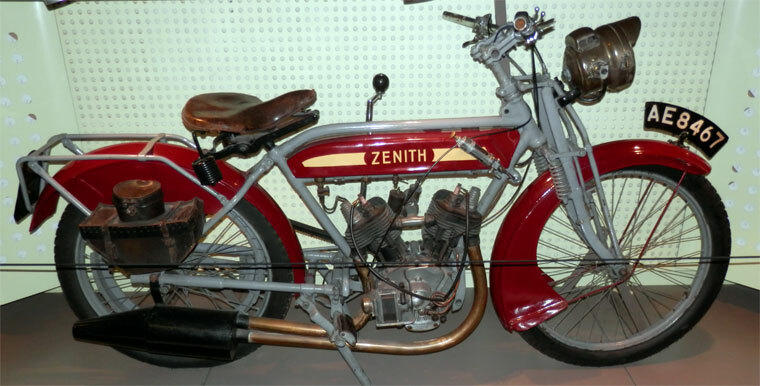 1928 The lightweight was replaced by one using a 172cc Villiers two-stroke engine. The firm still had a sporting interest, and that year O. M. Baldwin set the motorcycle world speed record at over 124mph. 1930 Joe Wright used a Zenith to take the record to over 150mph/240kmh. 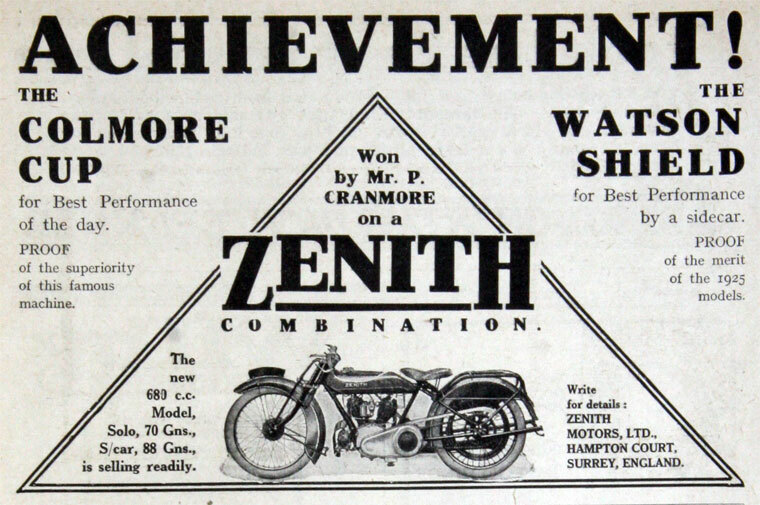 Unfortunately, these sporting successes did not sell many machines, and the firm was taken over by Writer's, a large south London dealer. 1931 A reduced range was listed, all with JAP engines. 1933 Twenty models were offered. 1934 The range had reduced to fourteen models. 1939 The range had dwindled to just six models, which were all somewhat old-fashioned. Post-war. They returned in 1947, but only one model was ever listed, and this used the 747cc sv JAP V-twin, in the pre-war format, with Druid girder forks. In time these were changed to Dowty Oleomatic. This page was last edited on 24 March 2013, at 09:08.